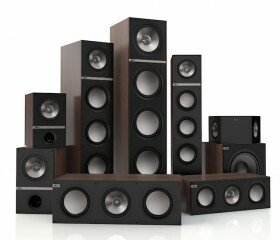 British speaker brand KEF last year launched their new and improved Q-series speaker line. According to KEF themselves the Q-series is built around the experience that KEF learned from building the state of the art Concept Blade speakers. KEF Claims that the Concept Blade speakers are “The leading edge of acoustic technology” which sets the expectations very high for the Q-series. The Q-series includes a total of nine different models: two bookshelf models, three floor standing models, two center channel models, one wall mounted dipole ambience speaker and one subwoofer. I will link to them all separately at the end of this post. As usual, I went to audition them and had the opportunity to listen to the biggest bookshelf model Q300 and the middle model of the floor standers which is the Q700. The two models I listened to are reasonably priced at €600 for the Q300 bookshelf speaker and €1250 for the floor standing middle model Q700. The biggest floor stander Q900 which I did not audition retails for around €1600 while the smallest bookshelf model Q100 retails for €500. This wide selection of model sizes and prices makes it possible to easier match the size of both your budget and your listening room. The build quality on the Q-series is good and the cabinets feel very sturdy. KEF has gone back to the conventional straight line box construction on the cabinets rather than the curved back and sides which the iQ-series had. This will most likely make the cabinets easier and cheaper to manufacture, but also obviously increase the enclosure volume which will result in deeper bass. The wood imitation finish looks kind of cheap and only come in 3 dark and boring colors, Black Oak, Cherry and Walnut which will be hard to match in many modern homes. I’d really love to see them in colors such as Light Oak, Light Mahogany or White lacquer. I started out with listening to the Q300 bookshelf model which has the 6.5-inch Uni-Q driver array equipped with the 1-inch aluminum dome tweeter in the center of the driver. The Q300 soundstage is wide and detailed with everything in perfect position. The midrange and treble is perfectly balanced to each other and play with a stunning resolution. The low frequency response is amazing with powerful and tight bass that is almost physical without breaking up or sounding strained. The Q300 sound and act like they were much bigger than they really are. I see no problem what so ever for the Q300 to fill out even pretty large listening rooms. Switching to the floor standing Q700, which is equipped with the exact same 6.5-inch Uni-Q array driver as the Q300. Additionally the Q700 has a 6.5-inch bas driver mounted in between two identical looking 6.5-inch passive radiators. The Q700 cabinet is a sealed enclosure which is divided into two chambers inside and each chamber is vented with a passive radiator instead of a bass reflex port. One of the passive radiators is used for the chamber with the Uni-Q driver and the other is used for the chamber with the bass driver. The Q700 sound much like the Q300 mostly because they use the exact same Uni-Q driver with the same tweeter. The biggest difference however is that the Q700 are much more physical and powerful because of its dedicated bass driver and bigger cabinet. They really impress with their massive yet firm bass which feel like they could tear up the demo room I was in. The midrange is in a way just slightly fuller on the Q700 then the Q300 which may be because of a bigger enclosure for the Uni-Q array. I really enjoy the KEF Q-series judging from the Q300 and Q700. They’re engaging and alive and I never felt that I would get tired of listening to them. Other than the slightly dull finish I have absolutely nothing negative to say about them. In its price range I think there will be very few alternatives that will measure up to the same performance and sound quality as the KEF Q-series and I really recommend that you audition them if this is the price range that you are looking into. In fact, I might even get the Q300 for myself!